Vancouver, BC – June 15, 2011. 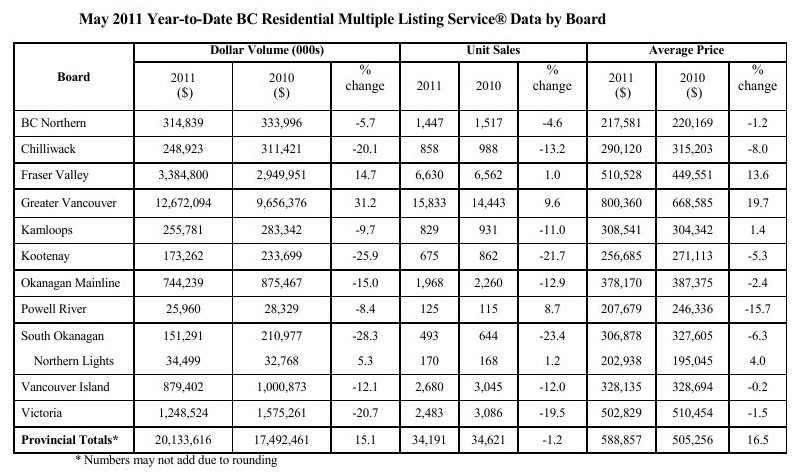 The British Columbia Real Estate Association (BCREA) reports that Multiple Listing Service® (MLS®) residential unit sales in the province edged down one per cent to 7,857 units in May compared to the same month last year. The average MLS® residential price climbed 20 per cent to $596,872 last month compared to May 2010. 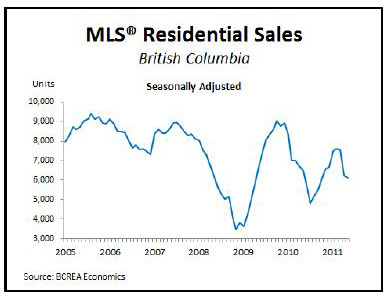 “Tighter mortgage rules, tepid employment growth and advance buying during the first quarter kept BC home sales on a lower note in May,” said Cameron Muir, BCREA Chief Economist. “However, recent downward pressure on mortgage interest rates is expected to provide some incentive to consumers over the summer months.” Year-to-date, BC residential sales dollar volume increased 15 per cent to $20.1 billion, compared to the same period last year. 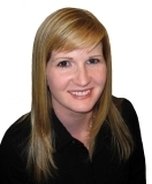 Residential unit sales edged back one per cent to 34,191 units, while the average MLS® residential price rose 16.5 per cent to $588,857 over the same period.